1. Take the stress out of writing your essays! Every fall, thousands of aspiring students just like you spend hours staring at a computer screen, searching for a clever opening line or life-changing experience. It doesn’t have to be that hard–we’ll help you push past writer’s block and find a topic that works for you! 2. Let your personality shine through! A good essay does not need to be a literary masterpiece or a scholarly treatise worthy of James Joyce. The best essays come from high school students just being themselves. We’ll teach you how to showcase yourself–and all the depth, with, charm, and quirkiness you bring to your daily life. 3. Submit an essay that will get you in! 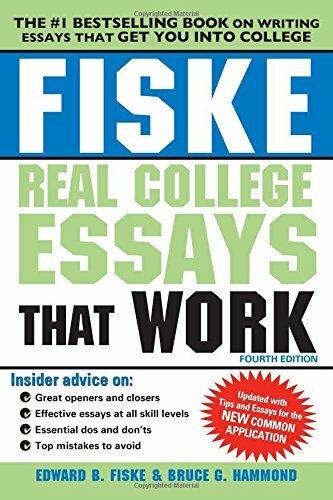 College admissions experts Edward B. Fiske and Bruce G. Hammond give you all the advice you need for an essay that will open the door to the college of your choice. You’ll find effective examples from real applicants–of all skill levels–and learn how to successfully bring your essay from initial draft to final submission.